Thank you for thinking of Ragazine! , to see if this is something that meets the intent. Carefully read the submission guidelines for each category below before querying or sending any submissions. Submissions that do not comply with guidelines may end up being shot into cyberspace. * Fiction/Nonfiction/Commentary, Reviews, et al: Double space between paragraphs. Do not indent paragraphs. Best to send using Times New Roman or Calibri, in either Word attachment or in body of email. * Poetry: We will try as we can to reproduce unusual formatting, but due to some limitations of WordPress, this may pose difficulties. * Photography & Art Work: Provide titles, medium, size, date, time, place/location, photo credits, and any other information relevant to the work. * If you do not send one, and if your work is accepted for publication, you will be asked for a short 3-4 sentence bio and a photograph (optional). * EBSCO Research Database is now including material from Ragazine.CC. 1) We are looking for an editor for our FREE ONLINE CALENDAR. Entails monitoring and posting events from around the country and the world. Familiarity with WordPress. 2) We are looking for a MARKETING/ADVERTISING/SALES manager. Contact editor@ragazine.cc for more information. We’re like work that will sit well on the screen. Take a moment, please, to decide for yourself what this means. We can say, for example, that we’d like work to “pop,” to be “imaginative,” “sharp,” “tight,” etc., but we’d possibly be limiting the variety of work that we love to publish. Simply put: Send us your best work that is completely revised and well-edited . Submit no more than one piece at a time; each submitted piece should be no more than 4,000 words, although most of what we publish falls in the 1,500 to 3,000 range. Allow 1-3 months for a response. Feel free to query after 3 months. Adherence to standard submission formatting is appreciated. World/Travel Guidelines: Editor is Chelsea Leigh Horne We are looking for pieces that capture the essence of a place through explorations of location, people, culture, or a distinct something else that feels intrinsic and integral to the world you are describing. Most importantly, we are looking for an informed and perceptive point/observation/commentary about this locale. While this is not meant to be an all-inclusive list, some topics of interest include (alphabetically): arts, culture, economic, environmental, historical, political, and social themes and impressions. In short, paint us a portrait and show us where you have traveled by immersing and grounding your reader in the setting and atmosphere. Then tell us why you needed to share and write about it. If something about a place hooked you, there is a good chance it will hook our readership too. For this reason, we highly encourage you to include your original photos (with credits to you) so that they might help frame your piece. Note: For this section, we are usually more interested in locations outside the United States. However, if you feel that you have a travel piece situated within the U.S. that you believe tells a compelling story, you may still submit to this section. Guidelines: • Submit only one piece at a time. • Each submitted piece should be between 1500 and 3000 words. • Please follow Ragazine’s general prose formatting guidelines. • For each included photo, please include a brief 1-2 sentence caption that describes the photo, and if necessary, its relation to your piece. • We do not accept pieces previously published online or in print. We do not accept simultaneous submissions. Please use SUBMITTABLE. CONGRATULATIONS: To Renee D’Aoust, whose story “The Line of No Trees” was recognized as NOTABLE by and among Best American Essays… 2016 edition. Read it here: https://www.ragazine.cc/2015/11/renee-daoustcreative-nonfiction/ To Alexis Rhone Fancher, for her poem, “When I turned fourteen, my mother’s sister took me to lunch and said:” … 2016 edition. Read it here: https://www.ragazine.cc/2015/01/alexis-rhone-fancher-poetry/ To Ginger Liu, who received her Master’s Degree from Manchester University, Manchester England, in 2017 To Paul Sohar, on his recent recognitions: “The Wayward Orchard”, a Wordrunner Press Prize winner chapbook (2011). First prize in the 2012 Lincoln Poets Society contest and a second prize from Rhode Island Writers Circle prose contest (2014). Translation prizes: Irodalmi Jelen Translation Prize (2014), Tóth Árpád Translation Prize and the Janus Pannonius Lifetime Achievement Award (both in 2016, Budapest, Hungary). “Image of the Day”: We’re looking for surprises… the kind of work we have to look at more than once. Have a photo, painting, print, collage, cartoon, comic or some other visual offering you want to blast out to Ragazine readers? 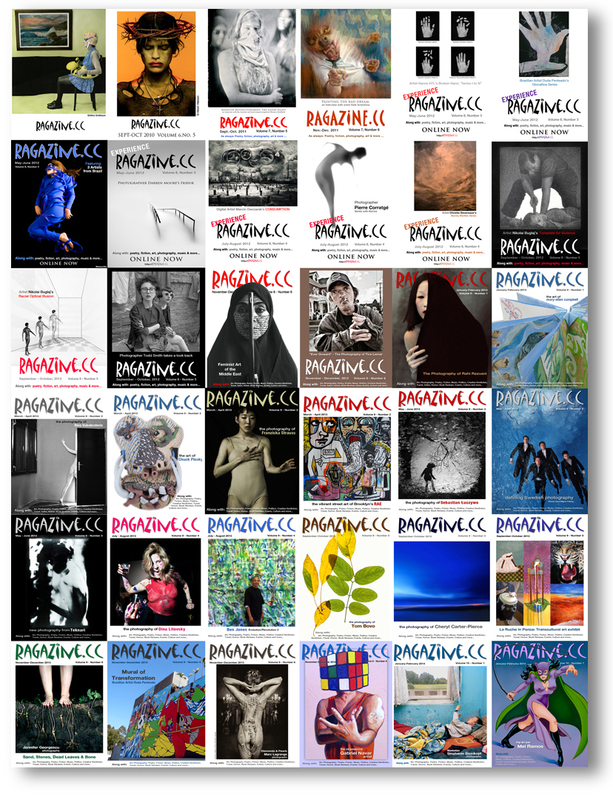 Email it to: Imageoftheday@ragazine.cc as a jpg attachment of 1 to 2 mb (1280 pixels/72 dpi). Include your name, email address, and a 2-3 sentence description of how you happened to create the image. No more than 3 submissions per year, please. Acceptance notification will be by email. As a volunteer organization, Ragazine does not pay contributors. See Copyright information below. SPORTS Feature Guidelines: Editor Position Open There’s more to sports than grown-ups playing games, and the amount of money they might earn. With this in mind, we are seeking lively sports and sports-related articles, including commentary and interviews, about those who play at the highest levels, and the influence they have on us personally, emotionally, or as guides to what level of performance we expect from ourselves. This is a new category for us — some might say what does it have to do with The Arts, Information and Entertainment? Well, entertainment certainly fills the bill; we’re opening the door to find out “what else”. Please query editor@ragazine.cc before submitting. Thank you. Ragazine.cc does not pay contributors. We are a volunteer online publication operating under the aegis of Binghamton Imaginink, a 501c3 registered non-profit organization. It would be great if we had the funds to pay contributors, but until then the best we can do is share your work with an appreciative international audience, and say a heartfelt thanks for all you do. Material that appears in Ragazine.cc is copyright the contributor, unless otherwise indicated. By submitting a work to Ragazine.cc, the contributor agrees that Ragazine.cc reserves first rights and the right for material to remain in our archives indefinitely. Published material may be used used in reference to previous issues, including works of art. All other rights revert to the contributor upon publication, including the right to re-publish elsewhere providing mention is made that the piece was previously or originally published in Ragazine.cc. If we publish something that has appeared elsewhere, we will credit that publication or venue, and we request the same courtesy from those who reference or quote material appearing in Ragazine.cc. All rights are similarly reserved by Ragazine.cc for material generated specifically for publication in Ragazine.cc by the Ragazine.cc staff. The Ragazine Group, Inc., is a 501-C3 corporation. Your donations may be tax deductible. Please consult your tax professional.